Bryan Beirne's "British Pyralid and Plume Moths" was published in 1952, as part of the Wayside and Woodland series of Frederick Warne. Like others in the Wayside and Woodland series, the original books are rare, and much sought after, putting the work beyond the reach of many. Pisces Conservation are delighted to have produced this volume in electronic form. 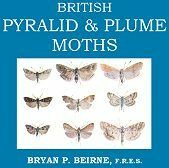 "British Pyralid and Plume Moths" is available on CD, for Windows PCs and Macs, with fully searchable text and hyperlinks for ease of navigation. The quality of reproduction of illustrations and text is excellent. With the advantages the PDF format allows, we have produced more than a facsimile copy, a genuine improvement which will bring the original work to life for the modern user.